High pressure twin wall flanged joint system for gas and oil condensing boilers with removable cover band. Lightweight pre-fabricated fully welded pressure system. Easy and quick to install with flanged joints and secured with a V band system. This product combines the best parts of both our HT Plus/HT-S product ranges and our PS system to provide a very economical chimney system without compromising on the ease of successful installation and resulting performance of Midtherm PS, on condensing applications. 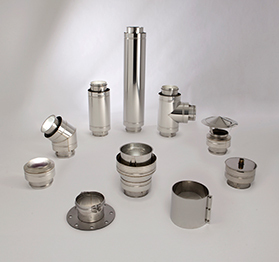 This product was launched to be competitively priced against the socket and spigot systems available on the market. Cover bands can be easily removed to allow joint inspection during the commissioning process if desired. Available in sizes from 125mm i/dia to 350mm i/dia. Suitable for use on condensing appliances. Flanged end fitted with V Band and locating spigot. To be installed with a cover band in place.